You will leave the port aboard your coach to visit the embroidery school XQ. Next you will proceed to the Long Son Pagoda, which was inaugurated in 1889. This is the city's most ambitious pagoda and has been rebuilt several times. Long Son Tu means "the Pagoda on the Dragon's Hill" and is home to around ten monks. The entrance and curved roofs are embellished with impressive decorations featuring mosaic dragons made from glass and ceramic tiles. If you are fit enough to climb up to the top of 152 stone steps, you will be able to admire a giant white statue of Buddha seated on a lotus blossom and superb views over the city far below. 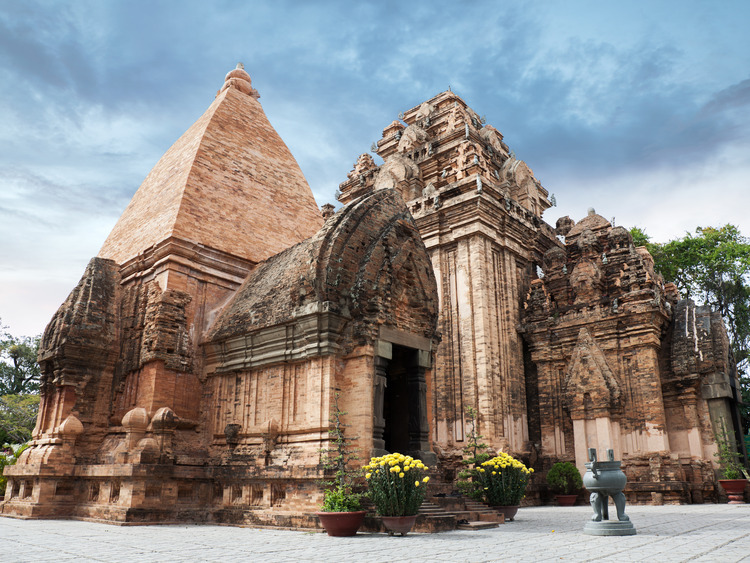 You will then travel to the Po Nagar Cham Towers, also known as Thap Ba (or the Lady of the City), a remnant of the ancient Cham civilisation. The towers, built and renovated between the seventh and twelfth centuries from loose brick with neither plaster nor mortar, were used for the worship of the goddess Po Nagar of the Dua clan, which ruled over the southern part of the Cham Kingdom. From the hillside where the towers stand you will have a spectacular view of Nha Trang Bay and its shores lined with numerous colourful fishing boats. Today both Chinese and Vietnamese Buddhists come to the Po Nagar Towers to pray and make offerings according to their respective traditions. Your journey will continue with a visit to Dam Market, the city's main market. It was built in 1969 on a swampy area of 7 hectares and completed in 1974. The market consists of a two-storey central building with circular floors and a V-shaped roof, plus two four-storey apartment buildings. Finally we will be able to taste a delicious coconut juice and relax at the Sailing Club before going back to the ship. Please Note: The order of the itinerary may vary. Please wear comfortable walking shoes and casual clothing. Don't forget to bring mosquitos repellent. When visiting the temple shoes should be removed and socks should be worn. Sunhats are recommended. The visit to Champa Ponagar Tower involves in climbing 154 steps.